Israel Approves Law To Block Entry To People Who Call For Boycotting Israel : The Two-Way It's part of an effort to combat a global movement that calls for cutting off economic ties in support of Palestinian independence. Israel has not explained how it will enforce the law. French demonstrators and supporters of Palestinians call for a boycott during a 2012 demonstration in Paris. Israel has passed a new law that allows it to bar entry to foreign activists who support a boycott of the country. 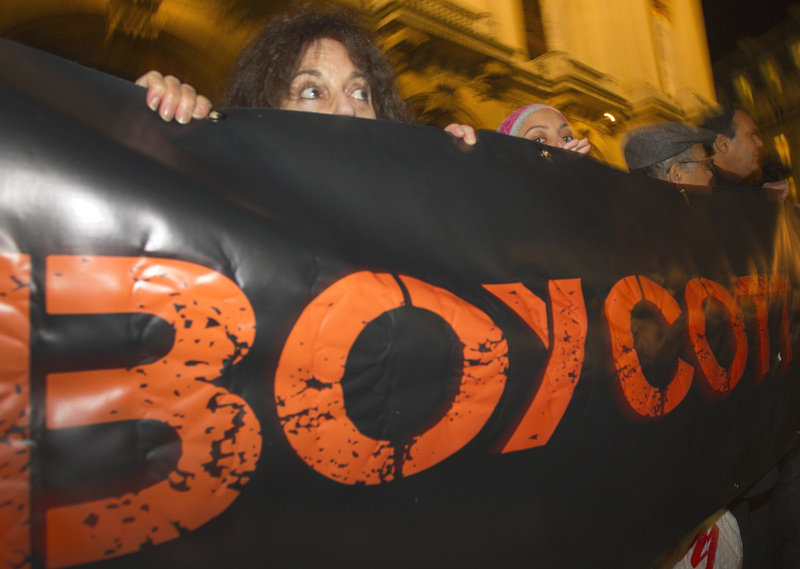 The law takes aim at the BDS movement, which emerged more than a decade ago and is an acronym for "boycott, divest and sanction." The BDS movement aims to put economic pressure on Israel in support of Palestinian independence. "It's part of an effort to combat a global movement that lobbies celebrities, companies and other groups to cut off ties with Israel. Boycott activists say it's a pressure tactic to promote Palestinian independence, but Israel says the boycott movement seeks to destroy Israel as a Jewish state altogether." Daniel reports that Israel hasn't explained how it will identify the visitors that support a boycott. "A spokeswoman for Israel's Interior Ministry says Israel is now formulating ways to enforce the ban," he adds. The new law includes a provision that would allow Israel to block entry to people who call for boycotts on Israeli settlements, according to Haaretz. Settlements, which are on land captured by Israel nearly 50 years ago that Palestinians want as part of a future state, are generally seen as an obstacle to peace, as we have reported, and the U.N. says settlements are illegal under international law. The committee that approved the bills' final language also rejected a Justice Ministry recommendation "to make an exception for Palestinians with temporary residency in Israel, like those admitted under the family unification program, who spend several years as temporary residents before receiving permanent residency," Haaretz added. Hardline education minister Naftali Bennett praised the law as "necessary and logical" in a post on Twitter. He said it "allows Israel to defend itself." Lawmaker Roy Folkman, who sponsored the bill, said, "We can defend the reputation and the honor of the State of Israel, and that is nothing to be ashamed of," according to The Washington Post. But it is eliciting sharp criticism elsewhere. The Israeli human rights group Peace Now slammed it as "neither Jewish nor democratic." It said in a statement that the law "will prevent Jews as well as others supporting two states by boycotting settlement products from entering Israel, and it is a clear violation of freedom of expression." "Instead, it is: 'Stay away. If you don't agree with us, there is no place for you here.'" A previous version of this story referred to settlements on land annexed by Israel in 1967. Israel captured the land but has not annexed the West Bank.